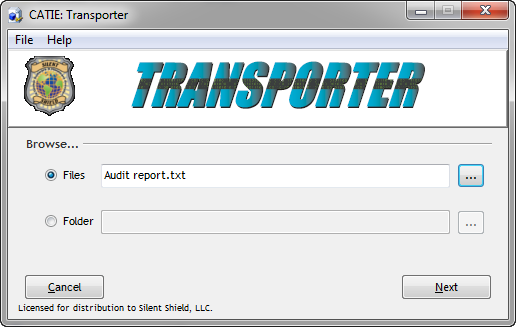 Transporter was built to allow even non-law enforcement officers the ability to transfer a file, several files, or even a complete folder encrypted to a second or third party. 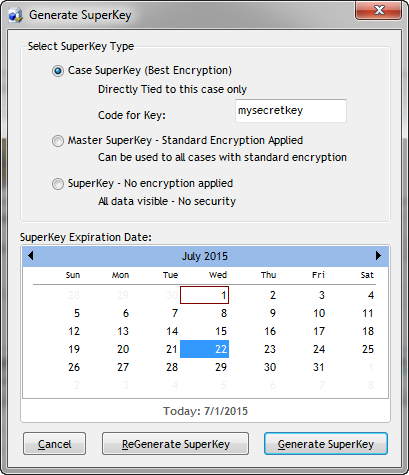 A custom key can then be set to expire after a predetermined time frame. During the process to encrypt the data, the user has the option to create a self-running executable that when launched will request the user to provide the “Superkey”. Once the key has been applied, the end user can extract the files into a desired location associated with their computer. This is the first screen you'll interact with. Select either a single file, a group of files, or the entire folder. 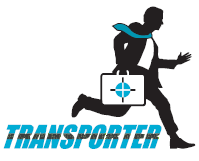 This part of Transporter allows you to select the type of container you want to deliver to your end user. Choices include a self-running executable (with your information) or a data file (dat). Using your secret phrase allows you to apply encryption to the files you wish to encrypt. The pattern used is not a simple password, but an actual file that must be used with the file to extract the contents. This is the file that is provided to the end user who is intended to receive your files. They enter a key to decrypt the data, which allows them to extract the contents. Note: All orders may take up to 48 hours to process.